This Trojan uses London Olympics 2012 as lure to users. The email message it sends tells users of a video about a scandal. Users are redirected instead to a fake YouTube page. This Trojan arrives as an attachment to email messages spammed by other malware/grayware or malicious users. This Trojan appends 30 random characters to the aforementioned sites. This may be an indication that this Trojan might use the altered sites for other purposes. Open Registry Editor. Click Start>Run, type REGEDIT in the text box provided, and press Enter. *Note: Some component files may be hidden. Please make sure you check the Search Hidden Files and Folders checkbox in the More advanced options option to include all hidden files and folders in the search result. In the Named input box, type the name of the file that was detected earlier. 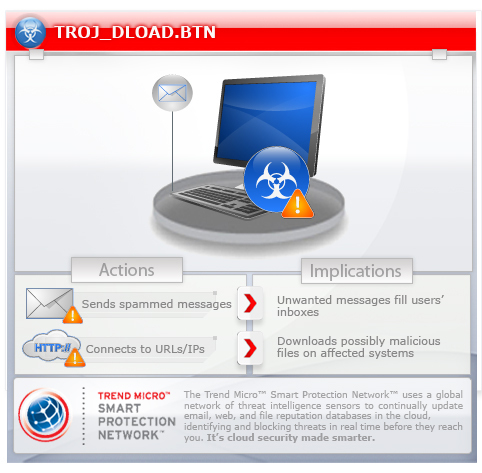 Restart in normal mode and scan your computer with your Trend Micro product for files detected as TROJ_DLOAD.BTN. If the detected files have already been cleaned, deleted, or quarantined by your Trend Micro product, no further step is required. You may opt to simply delete the quarantined files. Please check this Knowledge Base page for more information.